Tide is a brand of laundry detergent manufactured by Procter & Gamble. The development of Tide dates back to the 1930s when a group of researchers embarked on a study to develop a heavy-duty synthetic detergent. This was initially referred to as Product X. After over 200,000 hours of research, the team still could not find the right formula for Product X. One by one, all of the scientists who were involved in the project were re-assigned to other projects. All of them except one scientist abandoned the research on developing the heavy-duty synthetic detergent. The name of the researcher was David Byerly. David Byerly refused to shelve the research and his persistence is what resulted in the development of the first synthetic detergent by P&G. With Byerly finally discovering the correct formula for the product, the P&G moved it to the forefront of the company research and development projects. The product was named Tide, though it is still not known why the company chose the name. With the funding now in place, the researchers were able to do some fine-tuning of the product and finally put the product to market. 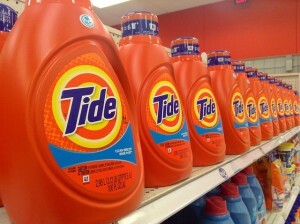 Tide was an instant market success for P&G. The product quickly outsold its competitors in the country, and greatly helped P&G gain a significant share of the laundry market. Tide was such a phenomenal success that it even outperformed the other soap products produced by P&G. By the early 1950s, Tide had already taken over more than 30% of the market share of laundry consumers. From that year until now, Tide has maintained its position as the best selling laundry detergent in the market. Tide has a multitude of different formulas to meet the needs of all laundry types, from scent and dye free formulas to those made especially for sports clothing to remove sports stains and odors. Tide is available in original powder form, liquid and pod forms.